They had come—the Dog Soldiers and their allies! As if sprung from the very ground, they were charging in, down the valley slope at the rear of the camp, in across the level on the east, up the river between, all in the dusky pink of the morning. They yelled and cavorted, their war bonnets streamed, their lance tufts tossed above their painted shields, they shook guns and bows, the earth trembled to the drum of the ponies' hoofs. Only the back trail, down river, to the north, was open. It would lead through the narrow end of the valley, and Colonel Forsyth was too wise a soldier to take it. The enemy would have asked nothing better; they hoped to force him and his fifty upon it and pocket them in the gorge. "Steady! Hold them off, men! Deploy your skirmishers, Beecher!" he shouted. He had been thinking rapidly. He remembered the Fetterman affair, of 1866, when just outside of Fort Phil Kearney in northern Wyoming Captain William J. Fetterman, Captain Fred H. Brown and seventy-nine men had been surrounded and killed by Chief Red Cloud's Sioux; had been ridden down in one last great charge. "How about that island, Grover'?" he asked quickly, while the men shot fast and the warriors began to gallop in a circle. "It's all we can do," said Scout Grover. "On foot, to the island, boys! Don't delay. Lead your horse, Tie them to the bushes and we'll fight from there." So in good order, covered by the skirmishers, they fell back across the first channel, to the little island. It was sixty yards long and only twenty yards wide; the up-stream half was the higher, of gravel and sand and willow brush. The down-stream half was low and almost bare, with one cottonwood tree as a sentinel. Scout Jack Stillwell and two other crack shots ran across the lower end and hid in a sand wash of the east bank—a natural rifle pit—to keep the enemy away from there. The rest tied the horses to the willow bushes, in a circle, and made ready to fight from inside the circle. They had managed to bring one mule with the extra ammunition, but they had left the medicine packs and all the camp stuff. "Lie flat, boys. Now, fire slowly, aim well, keep yourselves covered, and above all, don't waste a single cartridge," Colonel "Sandy" directed. Here they were, fifty-one surrounded by nobody knew how many warriors. As the morning grew brighter, Scout Grover estimated that there were one thousand. Colonel "Sandy" thought that there were not more than four or five hundred. They moved so quickly that it was hard to tell. But the truth is that there were at least seven hundred. The island was a piece of luck for the scouts. The enemy could not sneak upon it; the sandy strip on both sides was open to the deadly fire of the repeating carbines. Chief Roman Nose, the Cheyennes afterward said, was angry that his men had not seized the island them-selves. He sent two hundred of his best shots to crawl through the grass and weeds to the brush of the banks ; lying there they poured bullets and arrows into the white fort. That was a terrible fire. Scout William Wilson was killed, first, but the sharpshooters aimed principally at the horses. The scouts used the ammunition boxes and the horse bodies as breastworks; the bullets and arrows came in over. A great many Indian women and children had gathered upon the bluffs to the east; they shrieked and waved and urged the death of the white men. Brave Colonel Forsyth walked among his scouts, leading his horse and talking to them. They begged him to lie down, like the rest, but he would not. "Fire slowly. Choose your marks. Don't throw away a single bullet. That's right—dig when you can, but keep down," he said. "Part of you dig pits, large enough for one or two, while the others shoot." Old Doctor Mooers was using his carbine. Lieutenant Beecher, Sergeant McCall and Chief Scout Sharp Grover seconded their colonel with cautioning words. The men dug, while they lay flat; wielded knives and tin cups and fingers and toes, scooping out little hollows in the sand. The sun rose in the clear sky, flooding the island with light and showing the Indian women and children upon the bluffs, and the puffs of smoke from the red skirmishers, and the hissing arrows twinkling in, and the bonneted horsemen of Chief Roman Nose riding around and around, yelling triumphantly. Colonel "Sandy" uttered an exclamation, and sank. A bullet had entered his right thigh and glanced upward, making a painful wound. But he staggered to his feet again; hobbled about, directing and encouraging. Now he paused, and stooped to speak to a man who seemed to be getting nervous. A second bullet struck him—tore into the calf of his left leg, and through the large bone, and out. The bone was broken sheer in two. So he crawled with his elbows and lay beside Scout Grover. "There goes the last horse down!" This was true. Every animal had been killed. The fifty-one white men had been put afoot. Doctor Mooers' pit was large enough for two men. He had Colonel "Sandy" dragged to him, but could do nothing for him, yet. Nine o'clock had arrived. The sun burned, the air was blue with powder smoke. The circling warriors had disappeared. Roman Nose had withdrawn them up the river, around a bend that concealed them from the island. They were five hundred. The chief medicine man told them that the white men's bullets should not harm them—should melt before reaching them; his medicine was strong today. They listened, but they believed more in Roman Nose, who promised to lead them into the island and trample the white scouts under the ponies' hoofs. The word was borne to the skirmishers. The firing from the banks on both sides of the island increased. Two hundred guns and bows deluged the rifle pits with bullet and arrow, preparing the way for the charge. That was good tactics. Colonel "Sandy" and Sharp Grover and Lieutenant Beecher knew what was to occur. Orders were passed for the men not to reply to the firing, but to keep every carbine and revolver loaded, and wait. The colonel propped himself with his shoulders against the end of his pit, the better to see. A bullet ripped across his forehead; must have fractured his skull; gave him a blinding headache, but he could not attend to that. Doctor Mooers was shot through the temples. He acted unable to see, or speak, but he was alive. Lou McLaughlin had a ball in his chest. He fought on. The island was a hot place. Look! Here came the charge—first at a canter around the bend up stream, to the southwest. Eight ranks of horsemen, sixty warriors front, extending clear across the stream bed and upon the level ground on right and left! The riders were stripped and painted and feathered, their ponies were painted and decorated with streamers, they brandished bow and lance and gun and shield. And well before them all, there rode Roman Nose. He sat, bronze and magnificent, upon a splendid chestnut horse. Upon his head there was a great war bonnet, with two buffalo horns for its crest and an eagle-feather tail floating far behind. About his waist he wore a crimson officer's sash presented to him in the peace council at Fort Ellsworth. In one hand he carried a Spencer repeating carbine. At the left of the front line there rode the chief medicine man, painted hideously, and chanting. The women and children upon the bluffs were shrieking and singing louder than ever; medicine drums were being beaten; the bugle was pealing; and the fire from the banks doubled. But the scouts upon the island waited, as they had been ordered to. Colonel Forsyth, tortured with his head and his legs, gazed cool and tense. Sharp Grover and the other men chewed hard, moistening their dry lips, clutching their guns and peering over the sand mounds and between the horse bodies. "Now!" shouted Colonel "Sandy," bracing himself to level his own carbine. His scouts surged to their knees. The front rank of ponies and warriors had been torn to fragments, but the other ranks were coming on. The red horde broke like a wave dashing against a reef. Horses were swerving and running wild, some riderless, some bearing wounded warriors; horses were prone and kicking, warriors were lying dead, the river bed was in a turmoil. Down toppled the medicine chief, on the left. Roman Nose! Where was Roman Nose? There, at the fore, turned in his saddle and shaking his carbine with lifted arm while he whooped his braves to the charge again. The fifth volley drove through and through from front to rear. The charge slackened—no, it rallied—the Dog Soldiers lashed their ponies, hammered with their moccasined heels, obeyed Roman Nose and followed him. Their leaders were within ten yards of the end of the island. The scowling faces could be seen over the sights; every wrinkle was plain. The carbines were empty; the Indians streamed by, veering outward on either side, hanging low upon their ponies, racing for the prairie and for life. Cheering, the scouts sprang to their feet and fired shot after shot at close range of their revolvers. That completed the rout. The warriors bolted up the banks and into the valley on right and left. The time had seemed like an hour, but the whole business was over in two minutes. Now the cries of the women upon the bluffs changed to wails. The flower of the Cheyenne nation had been slaughtered, Sioux and Arapaho had fallen. The Indians in the grass and brush along the banks were furious. They reopened the terrific fire of bullet and arrow. The scouts replied, seaching the coverts for every movement, every puff of smoke. After a time the enemy withdrew. There was a lull. "Can the Indians do better than that charge, Grover?" Colonel "Sandy" asked anxiously. "I've lived on the plains ever since I was a boy, general, and I never saw such a charge as that. I think they've done their level best," Scout Grover declared. "All right, then; we're good for 'em," announced plucky Colonel Forsyth. Young Lieutenant Beecher crept unsteadily to him. "I'm fatally wounded, general," he said. "I'm shot in the side." "Oh, no, no, Beecher! It can't be as bad as that." So Lieutenant Beecher buried his face in his arm, to die like a soldier. He murmured the name of his mother. That was all. Pretty soon he became unconscious. He was past hope. So was poor Doctor Mooers, sightless and speechless. Of the three officers, only Colonel Forsyth was able to command, and he had been wounded three times. He called for the roll of the loss among the men. Scouts William Wilson and George Culver were dead. Old Louis Farley appeared to be fatally hurt, but was still fighting. Lou McLaughlin had been shot through the chest. Howard Morton had been shot through the back of the head, and one eye was destroyed, but he could aim with the other eye. Frank Herrington had been struck in the forehead by an arrow from an Indian boy; it had stuck fast; a comrade had cut off the shaft, and left the point in; then a bullet had glanced across and taken the point with it. Frank had bound his handkerchief around his head and had fought on. Sergeant McCall was wounded. Lad Hudson Farley had been shot through the shoulder, but he said nothing about it until after dark. In all, two officers and four scouts were dead or dying, one officer and eight scouts were disabled, and eight other scouts were wounded. That made twenty-three out of the fifty-one. The river bed and the prairie were strewn with ponies and not a few warriors. Thirty-five bodies could be counted. Roman Nose lay where he had fallen, with his sash not the only crimson showing against the bronze. Three warriors were stretched within twenty feet of the rifle pits. They had charged clear upon the island and part way into it! Scout Jack Stillwell and his two partners ran in and joined the company. Jack said that he had killed Roman Nose—had pulled upon him and knew that the ball had struck. The squaws were wailing in a chant that rose and sank and rose again. Tomtoms were being beaten. The Indians had assembled—matters looked like another charge. A chief appeared to be rallying the warriors The scouts saved their ammunition; did not shoot, at that distance. Sharp Grover asserted that the chief was urging the warriors to try again. "Once more," he was saying, "and we will bring the white dogs' scalps to our lodge fires." Scout Grover stood up, put both hands to his mouth, and shouted at the top of his lungs, in Sioux. "Hello, old fellow! Got any more people for killing? This is pretty tough, hey?" The chief stared in astonishment. "You speak straight," he shouted back. The island men busied themselves enlarging their pits, binding wounds as best they could with handkerchiefs and strips of clothing, and digging a trench to the water. Near noon the second charge was attempted. The scouts were ready; they held their fire until the foremost warriors were within one hundred yards; then they let drive. This time the charge was not so fierce; no Roman Nose led, and the ranks broke at the third volley. Hooray! Now the Indians rode around and around in a wide circle, shaking their fists and their weapons, and hooting and threatening. Another medicine man capered, upon his pony, away off toward the bluffs. Six of the best shots on the island aimed high, so as to be sure to reach him, and pulled triggers together. With a great yell he tumbled like a stone; his pony ran for the bluffs, and the women shrieked louder than ever. About three o'clock a third attack was made. The Indians hoped that by this time the island men would be so exhausted by heat and thirst and wounds that they could not resist. The whole force of warriors rushed by horse and foot across the valley, from either side, to storm both ends of the island. The scouts waited, received them with bullet after bullet from the repeaters; caught them as they vaulted into the dry bed; and although several did gain the low foot of the island not one stayed there alive. This discouraged the enemy. The Cheyennes, Sioux and Arapahos ranged themselves at long shot, and at and rested, or dashed back and forth. "We're all right, boys," he said. "Not a shot has been wasted. The advantage is ours. First, we've beaten them off; they know they can't lick us. Second, we can get water by digging only a few feet. Third, for food, horse and mule meat is lying around loose in any quantity. And last, we've plenty of ammunition. So we'll win out yet. Now while we've time let's connect all the pits with a parapet of the saddles and ammunition boxes and horse carcasses. Put the saddle blankets down for the wounded, and be cutting strips of meat from the animals, to dry. And start a well. One thing's certain: those Indians won't attack us at night. They never do. It isn't Indian custom. So we'll have peace till morning, and a chance to rest. After dark we'll send two men out, for Fort Wallace, to get help. They can take my field map and compass, and I think they'll get through." These were cheering words, just as to be expected from a. commander like "Sandy" Forsyth. After dark volunteers were called for, to crawl through the enemy's line and make afoot for Fort Wallace, one hundred and ten miles across the Indian country. Scouts Pete Trudeau and Jack Stillwell were selected. They set out at midnight, in their stockinged feet, walking backward so that their tracks should mingle with the in-pointing moccasin tracks in the sand. Tonight a heavy thunder shower drenched the island. It helped. The men lay quietly, with guards posted. They did not dare to light fires. The Indian camp was wailing and chanting. Before full daylight a party of mounted warriors again approached the island. They acted as though they thought that the white men might have abandoned it and were trying to escape by the trail down the river. This would have pleased the Cheyennes and all; they had left the down river route open, still, for a bait. The scouts crouched close; waited; gave them a volley that killed two and scattered the others. There were no more attacks today. The island was under siege, at long range. The men dug their well deeper; they strengthened their breastworks; gathered arrows and twigs and boiled a little horse flesh, for the wounded, in an old pickle jar that was in Colonel Forsyth's saddle-bags. Even if Scouts Trudeau and Stillwell had won free it would be some days before they reached Fort Wallace, and two or three days longer before help arrived. Tonight Scouts Pliley and Whitney were started out. They were forced back, before morning; could not find a hole. This night most of the Indian bodies disappeared; the Indians had been heard, creeping to them and dragging them away. Roman Nose had vanished. Only the three bodies near the breastworks remained. On the third day the Indian women had left the bluffs; but the warriors stayed, watchful. A party of them advanced with a white flag. "Sign to them to keep off," Colonel Forsyth ordered of Scout Grover. "Tell them this is no peace commission. Shoot the first fellow who comes within range." 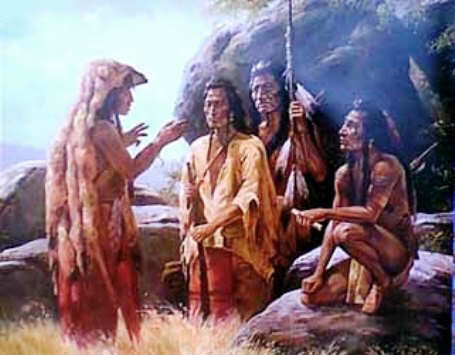 It was thought that the Indians hoped to be given the three bodies. Today the island men buried their own dead, while the Indians fired at long range. Lieutenant Beecher and four scouts were tucked to rest beneath the sand. Doctor Mooers moaned occasionally. He could not last much longer; lay stupidly, but seemed to know where he was, for once in a while he reached and touched Colonel Forsyth's foot. Scouts Pliley and Donovan volunteered to try again with a message for Fort Wallace. It was brave men's duty. The chances were that Scouts Trudeau and Stillwell had been captured. Then the Indians would be looking for other messengers—and capture meant torture. How was it possible for any white man to cross the one hundred miles of plains without being caught? Colonel "Sandy" wrote a courageous dispatch. He dated it at Delaware Creek, but he really was on the Arikaree River—which shows that he had entered unknown country. On Delaware Creek, Republican River, Sept. 19, 1868. I sent you two messengers on the night of the 17th instant, informing you of my critical condition. I tried to send two more last night, but they did not succeed in passing the Indian pickets, and returned. If the others have not arrived, then hasten at once to my assistance. I have eight badly wounded and ten slightly wounded men to take in, and every animal I had was killed save seven which the Indians stampeded. Lieutenant Beecher is dead, and Acting Assistant Surgeon Mooers probably cannot live the night out. He was hit in the head Thursday, and has spoken but one rational word since. I am wounded in two places, in the right thigh and my left leg broken below the knee. The Cheyennes numbered 450 or more. Mr. Grover says they never fought so before. They were splendidly armed with Spencer and Henry rifles. We killed at least thirty-five of them, and wounded many more, besides killing and wounding a quantity of their stock. They carried off most of their killed during the night, but three of their men fell into our hands. I am on a little island, and have still plenty of ammunition left. We are living on mule and horse meat, and are entirely out of rations. If it was not for so many wounded I would come in and take the chances of whipping them if attacked. They are evidently sick of their bargain. "Bring all the wagons and ambulances you can spare," Colonel Forsyth added. "I can hold out here for six days longer, if absolutely necessary, but please lose no time." This night of September 19 Scouts Pliley and Donovan took the message out. They did not return; when day dawned they were still absent. They must have got a little way, for no shots nor shouts had been heard. The Indians in sight gradually lessened. The island men ventured to steal to their former camp; they scraped some grains of coffee from the ground and brought in a couple of camp kettles. The mule and horse meat was spoiling rapidly, but they sprinkled gun-powder upon it to kill the odor, and cooked it. A coyote wandered near. They shot him and ate him. Between times they gathered at their colonel's pit, and talked things over with him. He remained true to his name "Sandy"—never was down-cast, never gave up, never asked for extra attention. Various schemes for relief were proposed. The little Jew proffered a plan for tolling more coyotes within range and shooting them. It sounded like a foolish plan, and he was laughed at by the men. "That will do," Colonel Forsyth rebuked. "The boy is inexperienced, but he deserves all the more credit for his willingness. Remember, he was among those who volunteered to go out with Stillwell, the first night. I think that under the circumstances he is doing as well as you older men." This was so. The undersized Jew boy had proved his metal. At fighting, nursing, guarding, eating horse meat, he had borne his part and more than his part. One man, the largest and the strongest in the company, had cowered at the first attack and shown himself to be utterly worthless. He was despised. The little Jew found some wild plums, and gave them to the wounded. The men gathered more, on the end of the island and on the banks; gathered the spiny fruit of the prickly pear cactus. The fine needles stuck in their lips and tongues. Colonel "Sandy's" thigh was hurting him cruelly. He begged the men to cut the bullet out. They would not; it lay close against the large .artery there, and they were afraid that he would bleed to death. Then he cut it out, himself, with his razor, and felt better. Once they lifted him upon a blanket, so that he might survey the country. A skulking Indian shot, and they dropped him upon his broken leg. The bone ends were driven through the flesh and he felt worse. September 22, the sixth day, dawned, and no rescue was in sight. By the sun and the rains and the night chill and the flies, the wounded were suffering dreadfully. The meat was sickening; the whole place reeked with the carcasses. Even the unwounded were growing weak. So Colonel "Sandy" called the men to him, and spoke. "You know the situation as well as I do, boys. Some of us are helpless, but aid must not be expected too soon. Our messengers may not be able to get through to Wallace, or they may have lost their way and be delayed. You have stood by me like heroes. I don't ask you to stay and starve. We can't live on this horse meat forever. The Indians have gone; we've given them such a lesson that I don't think they'll attack again. Those of you who are strong enough had better try for escape. You can't do any good by staying, and if you use care I believe you'll get away. The rest of us will take our chances here." "No, sir!" Sergeant McCall, the ex-brigadier general, added. "Not much, sir! We've fought together, and if need be we'll die together!" Not a man left the island. The message to Fort Wallace had said: "I can hold out here for six days longer, if absolutely necessary." The six days would expire on September 25. The men swiftly grew weaker. The dried meat all was gone, the cooked meat had been eaten; only the carcasses remained, and they—faugh! Soon the island was upon the shortest of short rations. Every mouthful of soup had to be swallowed with eyes and nostrils closed tight. By the evening of September 24 no one was strong enough to leave the island, afoot, even if he planned to. Matters looked very dubious. Scouts Trudeau and Stillwell had been out seven nights and days; and this was the eighth day for the island. The morning of September 25, the ninth day, was clear and hot, after a beautiful sunrise. Dark moving objects were seen upon the hills far to the south. The men stared with bleared, swimming eyes. "Well, we'll get some fresh horse meat, anyhow." They were still gritty, those Forsyth scouts. "Wait ! Isn't that a dog? Looks like Doctor Fitzgerald's greyhound." Doctor Fitzgerald was the post surgeon at Fort Wallace. Scout Sharp Grover leaped to his feet and flung his carbine into the air. "By the Heavens above us, boys, there's an ambulance ! It's the soldiers ! We're rescued." The black troopers of Company H, Tenth United States Cavalry, under Captain and Brevet Lieutenant-Colonel Louis H. Carpenter, poured down the hill slope and across the valley. Scouts Trudeau and Stillwell had reached Fort Wallace; so had Scouts Pliley and Donovan. Scout Donovan was guiding the "brunettes," and Stillwell was coming with Colonel Bankhead. The starved island men feebly cheered; they had no words to waste—they rushed the foremost riders, clung to the saddles and tore at the saddle pockets, crazy for food. Unable to rise, burning with fever and gaunt with hunger, he half lay in his pit, pretending to read a tattered old book. It was a paper-bound copy of "Oliver Twist." He dared not join in the excitement; he was afraid that he would break down—he had to be the soldier and the commanding officer. Colonel Carpenter galloped in. Colonel "Sandy" closed his book, looked up with a wan smile, and stretched out his quivering hand. "Welcome to Beecher's Island, colonel"
This story of Beecher's Island is featured in the book entitled the Indian History for Young Folks by Edwin L. Sabin and was published by George W. Jacobs and Company in Philadelphia in 1920.